Claire Vos: To me, technical possibilities mark the starting point for each project. The unique post-treatments and production methods we were introduced to by ICE International were the inspiration for my Dutch Landscape No.1. As the only one in the series, this rug was tufted by hand and then sheared to create a relief in the texture. There is a special trick to that: the relief was created in two contrasting colours over the central axis. 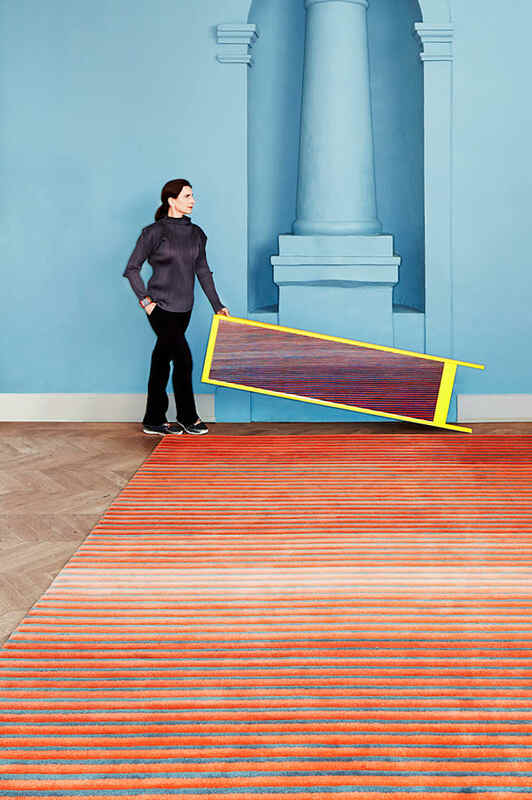 This creates a chameleon effect: walking around the rug, you see different colours from different sides. For this reason I would like to see this rug being used wall to wall in a public space. I think it would have a hugely surprising effect to enter a space and see a rug in a specific colour, and then see a totally different colour when turning back from the other side of the space! The play of colours is strengthened by the degradé. This also typifies my work: whether it involves colour, motif or material, the gradient is a constant source of inspiration. Coming from a family with a history of four generations of textile designers, this project was perfect to express my love of textiles.